Southwest Archery (SWA) has made a name for itself providing beautifully made recurve bows in many sizes and draw weights, that are great for the entire family. The first thing you’ll notice about these bows is the way their risers are designed out of wood. Many of them come with arrow rests. With each of these bows, you’ll get the string, too. Some of them are takedown, meaning you can detach the limbs from the riser, while others are just all one piece. All Southwest Archery bows also come with a 1-year manufacturer’s warranty, so you get peace of mind when choosing to purchase one of these either as a first-timer or to add to your existing collection. This company is based in the United States, so you know you’re getting excellent craftsmanship and attention to detail that you wouldn’t get from imported bows. Also, Southwest Archery stands by their products and is able to provide a relatively low price point. Take a look at the models they offer – whichever one you decide on will be built to last and provide you with hours of fast, silent shooting! 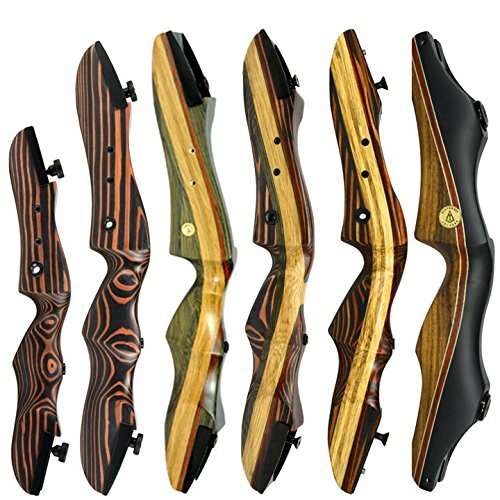 Let’s look at a few of the latest recurve bows that Southwest Archery proudly offers. This handsome traditional hunting longbow is made of the same materials as Southwest Archery’s Tigershark series, which are four naturally sourced woods: dymond wood, tiger wood, white oak, and padouk. You can choose to purchase it in either right- or left-handed models. There are plenty of draw weight sizes, so that the whole family can find the perfect sized bow for them. This is not a takedown bow that you disassemble; rather, it just comes in one piece. It was originally designed by the same archery enthusiasts and engineers of the Samick Sage. The Scorpion’s details really make this long and beautiful bow stand out. Reinforced limb tips mean that it’s both Fast Flight and Flemish string compatible. It comes with one 16 strand Dacron string that is strong, durable, and weather resistant for consistent outdoor usage. A pre-installed shelf pad comes with this recurve bow, for you to rest your arrows on before shooting. You also get a detailed instruction booklet telling you how to get it set up, how to position it, and tips for excellent shooting. Arrows are included in the bow and arrow set, too. Longbows are the ‘original’ bows based on designs from medieval England and Europe, so you are definitely following in a long standing tradition by purchasing this bow. With a world of available variations, Southwest Archery has outdone themselves by offering this excellent StingRay ILF phenolic takedown recurve bow. ILF stands for international limb fit, so that means it is made to fit a number of limbs. 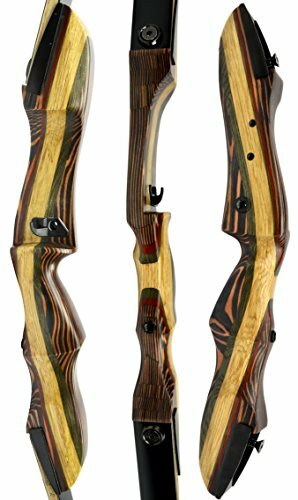 Depending on the draw weight, the riser for this popular and handsome bow comes in two different types of wood. The 50 lb. and 55 lb. limbs are made of carbon and fiberglass, while every other draw weight size is made of hard maple and fiberglass. Both styles are sleek, attractive, and light weight. A red wood piece in the middle gives it a striped appearance. It comes with an Allen wrench tool for adjustment, as well as the appropriate bow string. This bow is mostly for target shooting or simple hunting since it doesn’t come with any pre-threaded bushings for attaching sights or other items. It also doesn’t have any arrows. There are also size options, with shorter bows having shorter risers. The 58” bow has a 15” riser and medium limbs, the 60” bow could be purchased with either a 15” riser and long limbs or a 17” riser and medium limbs, while the 62” bow length has a 17” riser and long limbs. All limbs have reinforced limb tips, making them Fast Flight compatible. It is not compatible with the Flemish string, though. You can also choose from either right or left hand models. 7 1/2" - 8 1/2"
The Southwest Archery Spyder comes in both standard and XL sizes, so if your draw length is over 29”, then the larger model would fit you much better. 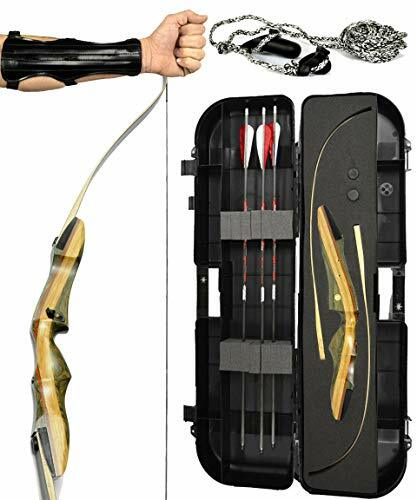 In either case, this 3-piece takedown recurve bow can come in either right- or left-hand models. It was designed by the makers of the Samick Sage, although it’s definitely been improved. The riser hard edges and limb pockets are rounder, which lessens the overall weight and makes it more comfortable to shoot, while flush limb bolts provide a more streamlined look and feel. You’ll also notice a layer of red wood added in between the brown and lighter beige woods for aesthetic reasons, so it stands out. Like other Southwest Archery recurve bows, this one also has reinforced limb tips that are Fast Flight compatible. When you purchase the complete kit, you get the bow, a bow string, an arrow rest, a hard case, a stringer tool for stringing the bow, a handy armguard, and three premium carbon arrows in your choice of colors. The case fits both the limbs, the riser, and all of the accessories in padded foam, so it protects it when traveling. Of all these Southwest Archery recurve bows, it’s the only one that comes gratis with a stringer tool for assembling or disassembling the bow. All other ones, it needs to be purchased separately. The case can also be purchased separately. It’s an excellent bow for either beginners or those getting back into archery after a long hiatus! 7 5/8" - 8 1/2"
Handsome, slim, and extremely high rated, the Tigershark is one of Southwest Archery’s best recurve bow models. It’s a third generation upgrade from the Samick Sage and made of premium quality wood. As a takedown recurve bow, you can easily assemble or disassemble the limbs from the risers. The risers are of an elegant satin finish, the edges have been improved and made rounder to lessen the weight, it’s Fast Flight compatible, and the limb tips have also been reinforced. You’ll also notice the better flush limb bolts, which even more resemble high end bows at the Southwest Archery price tag. Limb bolts make all the difference. When traveling back and forth to the field or events, this bow is also portable, and you can take it apart. In addition to choosing either right- or left-hand models, you can also pick either Standard or Pro. The Pro has precision pin-locking technology to guarantee exact limb placement. But both models have preinstalled threaded bushings, so you can add more accessories, like a sight, a quiver, or parts for bow fishing. The sky’s the limit when it comes to customizing your Tigershark bow. The Tigershark model from Southwest Archery has proven so popular, that the company now offers a one piece version. It’s not portable like the takedown recurve bow, but you still get many of the same extraordinary features and benefits. It’s a little shorter, being 60” rather than 62”, and is available for right- or left-hand orientations. As you’re selecting your draw weight, you also have the option to purchase a stringer tool, which is highly recommended for proper assembly and disassembly. Just choose your draw weight and your arrows, and you’ll be ready to use this great bow. Four naturally sourced woods make a handsome, straight forward recurve bow you can use for target, traditional, and bowhunting archery. The reinforced limb tips are both Fast Flight and Flemish string compatible as well. It’s quiet without needing silencers, and you won’t feel any shock after shooting, either. Even the lower draw weights shoot for power. Just like the takedown version, this one piece bow also has the preinstalled threaded bushings for adding accessories. In this kit, you get one bow, a 14 strand Dacron string, a preinstalled shelf pad, and instructions for stringing and shooting. It’s the mark of a high end bow to have the shelf pad included, so you can just rest your arrow, draw the string back, aim, and shoot. It’s very simple and straight-forward to use. 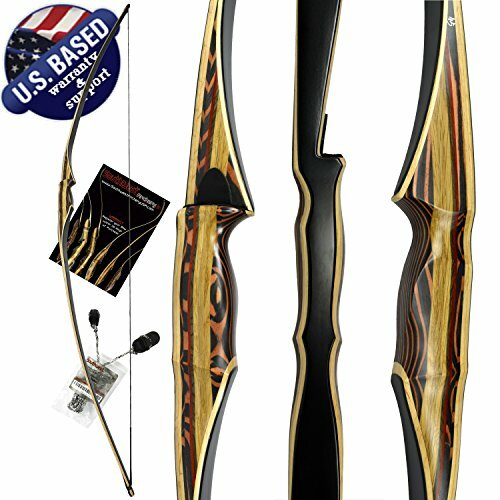 Compact, fast, and accurate, this Southwest Archery Tiger takedown recurve bow has an attractive look with its orange and black ‘tiger’ stripes made from naturally sourced wood. The wood is clear coated to be rain resistant. With this bow, you get a whole range of different hand orientations (right or left hand), draw weights, and riser sizes. The Tiny Tiger model is 48” and has a draw weight of only 29 pounds, so that’s best for kids ages 12 and younger. The Little Tiger is 54” with draw weights of 16, 20, or 24 pounds, great for older kids and teens. 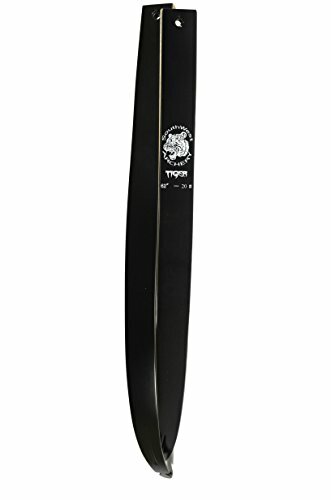 The standard Tiger, excellent for teens or archery beginners, is 62” and draw weights are listed below. There are preinstalled threaded bushings for accessory attachments and upgrades, so you can use it for bow fishing or have a sight or quiver attached. At the ends of the limbs are reinforced tips, so that they’re both Fast Flight and Flemish string compatible. Included with your bow (which includes the central riser and limbs) is a Dacron string, a stick-on adhesive arrow rest, and instructions. Unlike some other Southwest Archery bows, the arrow rest is not part of the design. It also does not come with a stringer tool, so you’d need to purchase one separately for proper stringing. This is a perfect beginner’s bow and also comes with an affordable price, so that even the youngest family member can get started in archery. 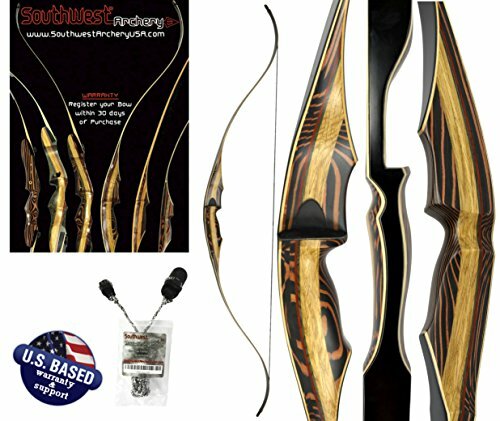 Southwest Archery prides itself on offering price affordable, handsomely crafted, durable, and sleek recurve bows for the entire family. Whether you choose the smaller Tiger models for kids, one of the Tigershark, Spyder or StingRay models for more experienced archers, or the gorgeous Scorpion longbow version, you’ll have an excellent shooting experience. These bows were built to last, they’re quiet, and the takedown models disassemble easily for travel and storage. Some of them come with arrows, a case, arrow rests, and preinstalled bushings so you can customize your bow with the accessories of your choosing. These are definitely the best of Southwest Archery’s recurve bows, and they don’t disappoint.